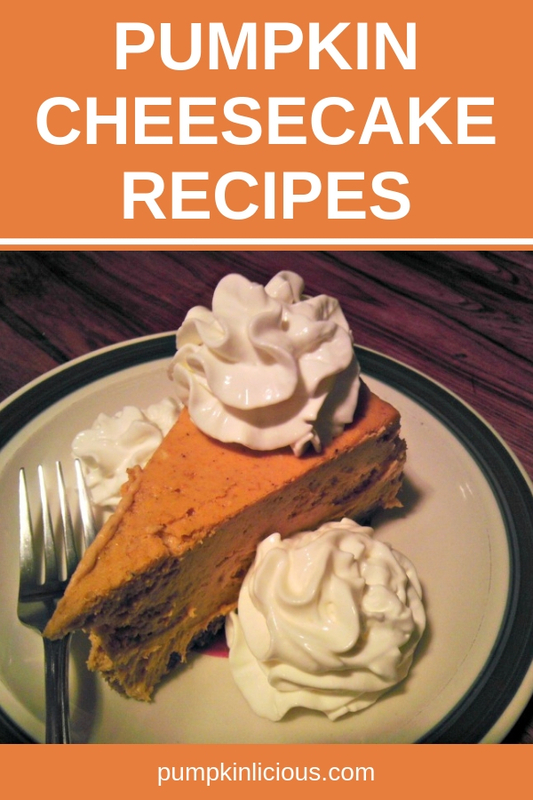 You are here: Home / Pumpkin Recipes / Pumpkin Cheesecake Recipes For A Stellar Dessert! Pumpkin Cheesecake Recipes For A Stellar Dessert! Add a touch of color and a bit of seasonal spice to and old favorite dessert. These pumpkin cheesecake recipes are perfect for the holidays. Cheesecakes made with pumpkin have a warm orange glow which makes them very appealing. Using pumpkin pie spices or other flavors such as chocolate or ginger will take a basic cheesecake and transform it into something much more special. Cheesecakes are not difficult to make, but the thing I discovered is that you need to plan ahead. They take a long time to cook. And then they need to be chilled in the fridge, preferably overnight. So start early the day before. If you’re like me, you’ll never have all the exact ingredients you need in the cupboard. I am never scared of substituting walnuts for pecans or using brown sugar or honey or maple syrup instead of regular sugar. Quite often you get even better results. You can always use yogurt instead of sour cream too. It’s no problem using low-fat versions of cream cheese or cream if you like. So don’t worry about experimenting a bit. As long as you keep the quantities right you should be fine. Don’t stop at pumpkin pie! Get creative and use pumpkin in all your favorite fall desserts. Today we’l look at how you can spice up your cheese cake and transform it into a delicious treat for Thanksgiving. Pumpkin Pie Spice Cheesecake – This recipe has the lovely aroma of pumpkin pie spice and the color of autumn. Pumpkin and Ginger Cheesecake – Lots of pumpkin soup recipes call for ginger, as it’s a great combination. It’s easy to get the ginger flavor in a cheesecake by using ginger biscuits or cookies for the base. This one is easy to make gluten and/or wheat free if needed. If you are a lover of toffee flavored coffees and deserts, this type of cheesecake should be right up your alley. Pumpkin-toffee cheesecakes are made much like a standard pumpkin cheesecake, with the addition of a few extra ingredients including cinnamon and about two cups of crushed toffee. In some recipes, part of the toffee will be melted down and incorporated into the cheesecake mix while the rest is used as glaze and decoration. This will create an explosion of rich toffee flavor. YUM! The combination of pumpkin and chocolate in a cheesecake sound like heaven on earth. 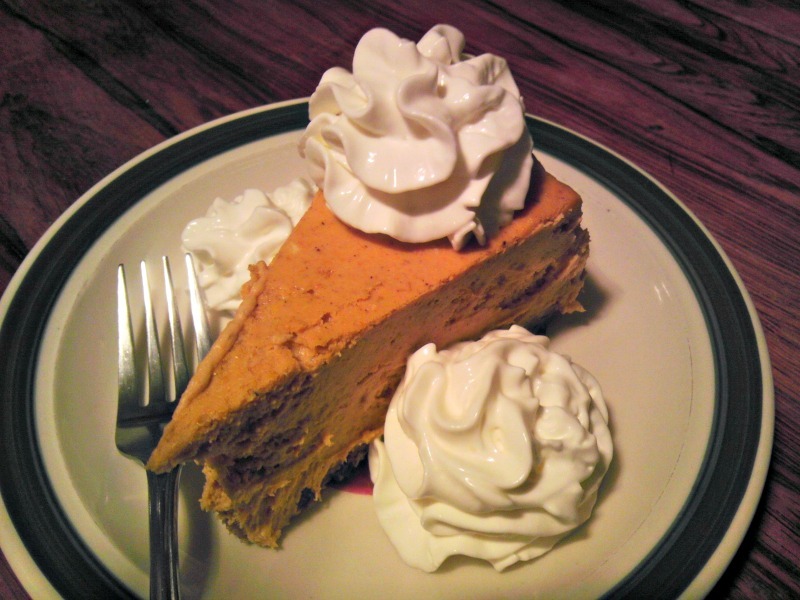 No matter what flavor of cheesecake you like, you can always spruce it up with a little bit of pumpkin!